The first Scofield Study Bible, published in 1909 and revised in 1917, is one of the most influential theological works of the early 20th century. Edited by Cyrus Ingerson Scofield, the Scofield Reference Bible was published by the Oxford University Press and became known to many as a handbook of fundamental theology. 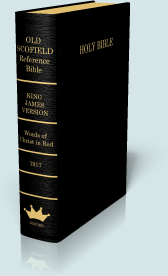 The Scofield Reference Bible contains very brief commentary, often consisting of no more than a few sentences and several cross-references. The brevity of the notes allowed Scofield's commentary to be included in the margins and footnotes in study Bibles, which countless Christians use as their primary study Bible. "The Bible, incomparably the most widely circulated of books, at once provokes and baffles study. Even the non-believer in its authority rightly feels that it is unintelligent to remain in almost total ignorance of the most famous and ancient of books. And yet most, even of sincere believers, soon retire from any serious effort to master the content of the sacred writings. The reason is not far to seek. It is found in the fact that no particular portion of Scripture is to be intelligently comprehended apart from some conception of its place in the whole. For the Bible story and message is like a picture wrought out in mosaics: each book, chapter, verse, and even word forms a necessary part, and has its own appointed place. It is, therefore, indispensable to any interesting and fruitful study of the Bible that a general knowledge of it be gained." A modern version of the Reference Notes (called the New Scofield Reference Bible) exists, but is a 1967 revision bearing no real relation to C. I. Scofield. 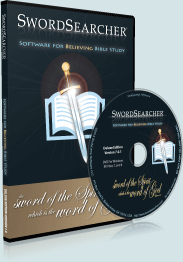 The SwordSearcher Scofield commentary module contains the reference notes, commentary, introductory text, and margin references from the original 1917 edition, often called the "Old Scofield Bible."